If you’ve haven’t tried lavash yet, you should. But if you have you know it is a tasty flat bread falling somewhere between a tortilla and naan (or a pita). It is delicious and very versatile. Great for wraps of any kind, it gets really crispy when baked, and it isn’t all that bad for you! Trader Joe’s has great whole wheat lavash that I like and it is what I used to make a quick dinner last night. 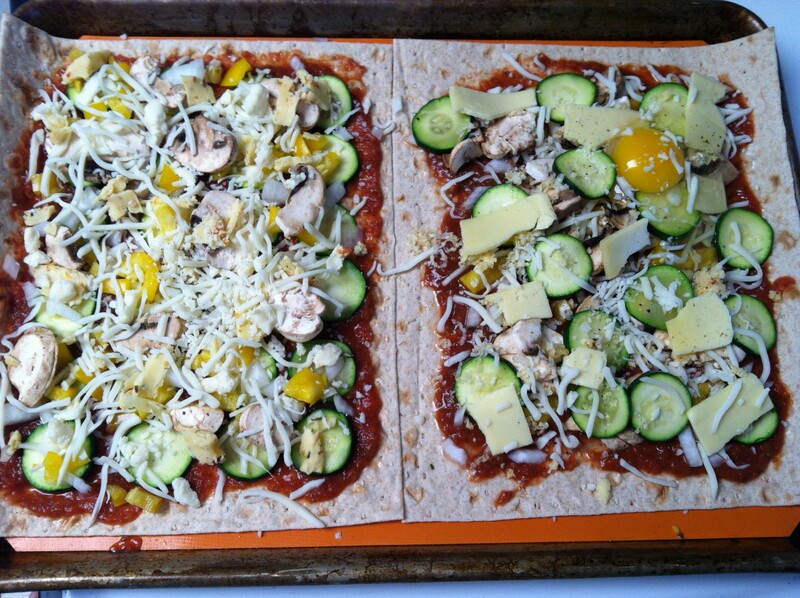 These are our pre-cooked lavash pizzas! 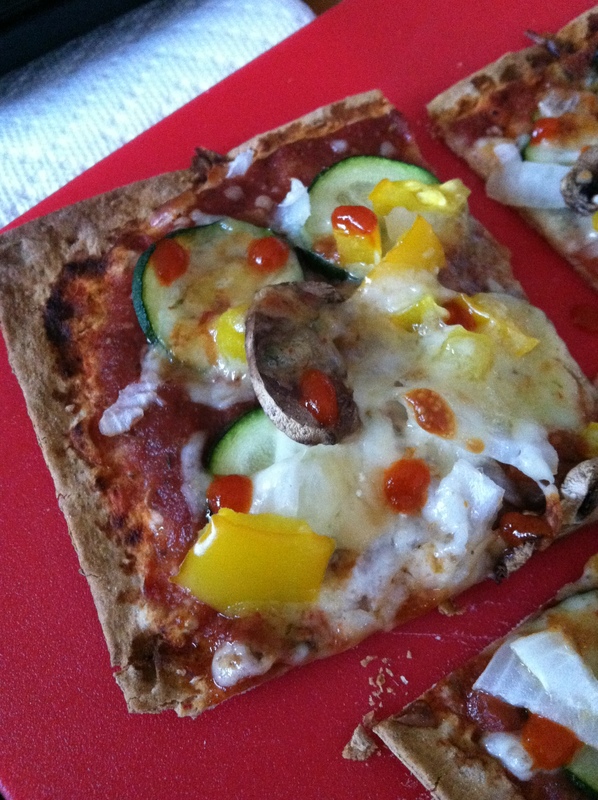 We both used zucchini, yellow pepper, onion, and mushrooms along with mozzarella. 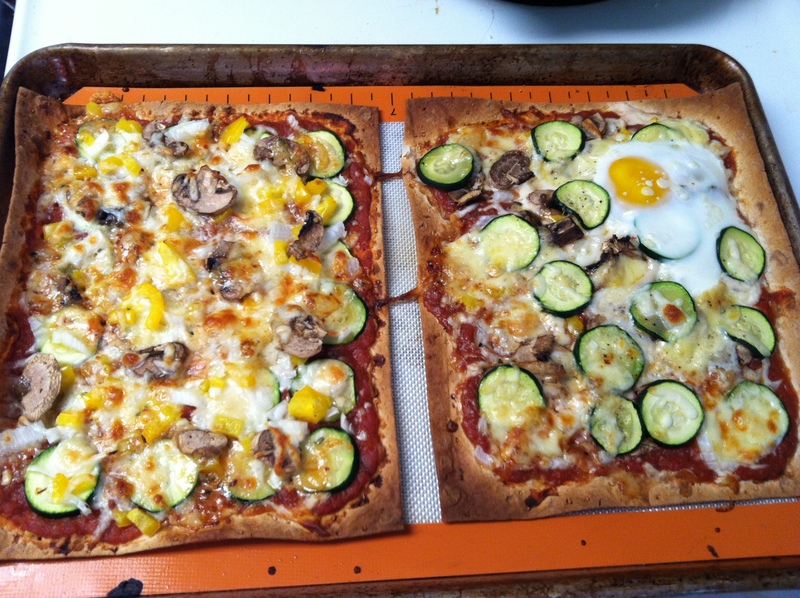 The egg pizza is Mr.’s creation. About 10 minutes at 375F and these beauties came out ready for grubbin. I used a regular baking sheet and it inhibited the middle of the crust from getting nice and crispy. This was a reminder that I need to get an new baking stone. My last one broke in December and I haven’t replaced it yet. Even though the middle wasn’t totally crispy, the pizzas were delicious! Another awesome thing about using lavash for pizza is the square pieces! I know not everyone is a fan of the square cut, but having grown up on Milano’s (the best pizza on this planet – south side Chicago deep dish spinach and thin crust veggie would be my death row meal) I love the corners the best! Also, no slice of pizza is complete without Sriracha. Just saying the name Sriracha makes my mouth water.